What would you do if you had a long weekend in south-east Asia? Don’t tell me yet. Last week, I trawled through websites, blogs, and even had actual conversations, gathering answer after answer. Some said Langkawi. Others said Bangkok. “I don’t want to get on a plane,” I realised. People asked why and I couldn’t quite answer them. So they shrugged and said Malacca or Bintan or Johor Bahru, or one of the more southerly island resorts, such as Rawa. None seemed right. At the last moment, I figured it out. 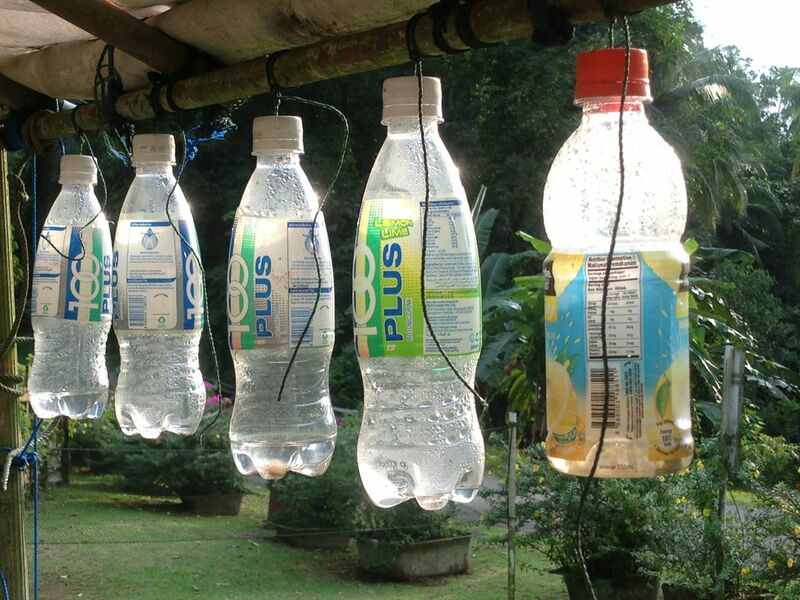 Like these old plastic bottles, I was struck by the light. Singapore is a city both well-planned and well-regulated. They’ve caged mini forests, and fenced in the bay. There’s either too much work or too much leisure – but either way, it’s compartmentalised. There’s no disorder, no grey areas. I’d had enough. The last thing I yearned for was more neatly-functioning transport systems, well-groomed sands, sparkling buildings or smiling service. I guess we all have our opinions on the soul, but it seems to me that as long as it’s bound in earthly form it must hanker for a life reflecting the chaos of this blue-green sphere it wakes upon. The sun. The breeze. Sweat. Thunder. Rain. If there’s order there, it takes some searching for. So no sleek modernity, no compartmentalisation. Anyway, we are flat broke on account of booking airfares to Tasmania, Brisbane and Tokyo (squee! but also eek!) on the same credit card bill. Enter the Camping Weekend! The uncompartmentalised holiday: not exactly “work” but not really “fun”. Presently, we own one two-man tent, so only half of us could sleep out. 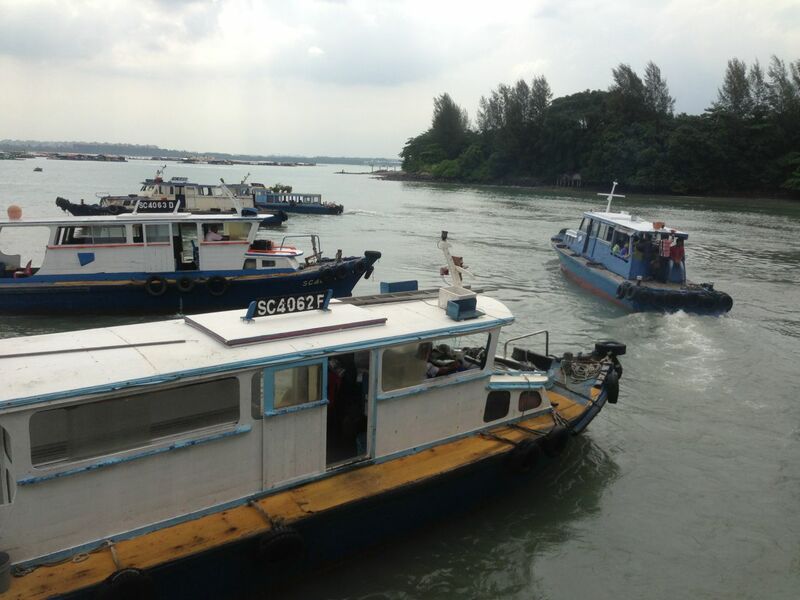 But we all made the trek to Changi Point Ferry Terminal and boarded the bum boat to Pulau Ubin. On weekends it takes about five to ten minutes to collect enough passengers for a sailing – on weekdays, between fifteen and thirty. Pro tip: the set of benches is the queue. If there is an empty space on the bench closest to the sea, people will take that as an invitation to join the head of the queue. Pro-pro tip: if there is any question of who is ahead of whom in the queue, it helps to look Chinese. The boat operators aren’t strong in Foreign and will gravitate towards anyone they think they can communicate easily with. Both of these tips apply only on the way out. On the way back, there is a fiercely efficient group of women organising everyone – just follow their directions. You won’t have the option to do otherwise. After a brief frolick on the beach gawking at rock pools, we decided we should register our intention to camp at the local police post, which is just to the right along the shore as you leave the jetty. The road to the right as you leave the jetty. Walk past the sign of the guy saying you’ll get shot if you enter here, and hang around at the locked front gate looking like a bit of a knob until some young bloke in a uniform lets you in and takes your details. The promised safety briefing is not, apparently, routine. You might get asked off-handedly where you intend to camp, but don’t worry too much if you haven’t chosen a site yet. Nobody else will. All the information you need is on the map next to the jetty. Currently, there are two campsites to choose from. (Noordin is closed due to erosion. Updates can be found here under “notices” at the bottom). Both are free of charge and do not require advance booking. No planning! We fuelled up on fried snacks at a local restaurant, where service was nothing short of slovenly (which is a change, which by itself is a holiday). We then hired two bikes so we could scope out our campsite options. 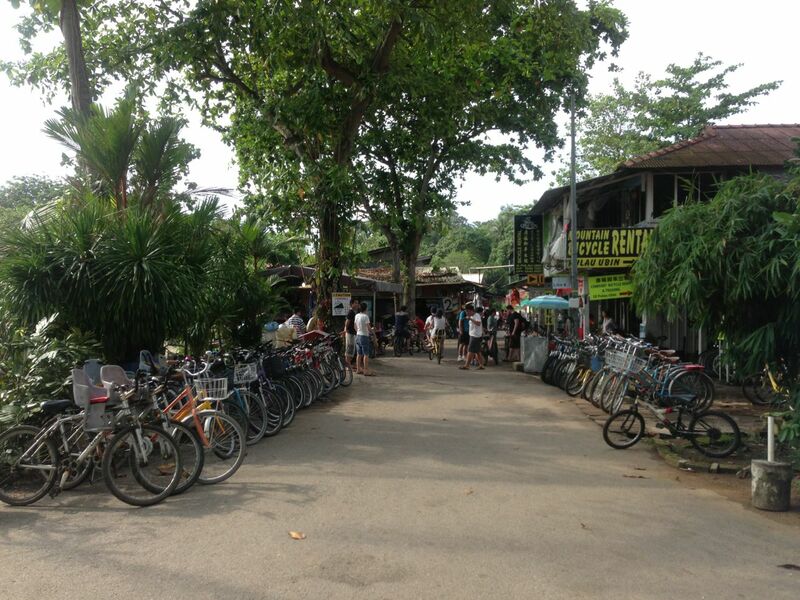 It’s not hard to find bike rental places or restaurants on Pulau Ubin. It’s actually harder to not find them. Somewhere in the background of this picture there’s even a convenience store (closes around 8:30pm) and an adventure centre where signs said ‘kayaking’ (closes by 6). A and T took a single bike with a baby seat, and P and I picked a tandem with a chain which kept slipping off. Neatly-functioning transport systems – take that! 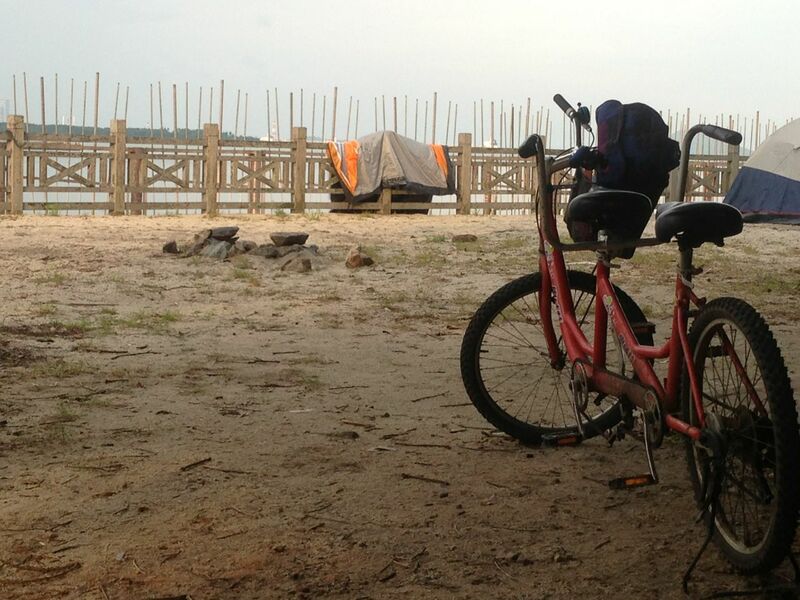 There’s not much road traffic on Pulau Ubin – only a few minivan “taxis”. After several miles of cycling to and fro – to the tune of either Postman Pat or, if you picked the other passenger, constant shouts of “You’re veering towards the edge of the road!” (yelled at every fractional departure from the invisible median strip) – we found Mamam. It had a toilet block with squat toilets, solar-powered lights, and non-potable running water, plus picnic tables – and a cozy neighbourhood of tents overlooking the sea. Note: because the water at the campsite is not drinkable, you’ll have to bring your own drinking and cooking water. …and nearly 3km to a meal you don’t have to cook yourself, it’s easily the most remote campsite in all of Singapore, beating out the one near the bright lights and foodie havens of Changi Village and the one next to the twenty-four hour McDonalds at West Coast Park by a Singapore mile. We decided it would do nicely. So we cycled back to the bike hire shop together, where we returned our extra bike and retrieved our tent. Then P and A headed back out to Mamam to pitch camp for the night, having drawn the ‘camping’ straw, whilst T and I took our boat back to sparkling, organised Singapore. A and P cycle off into the wilderness on a bicycle built for two. Me and T sail towards the bright lights of home. 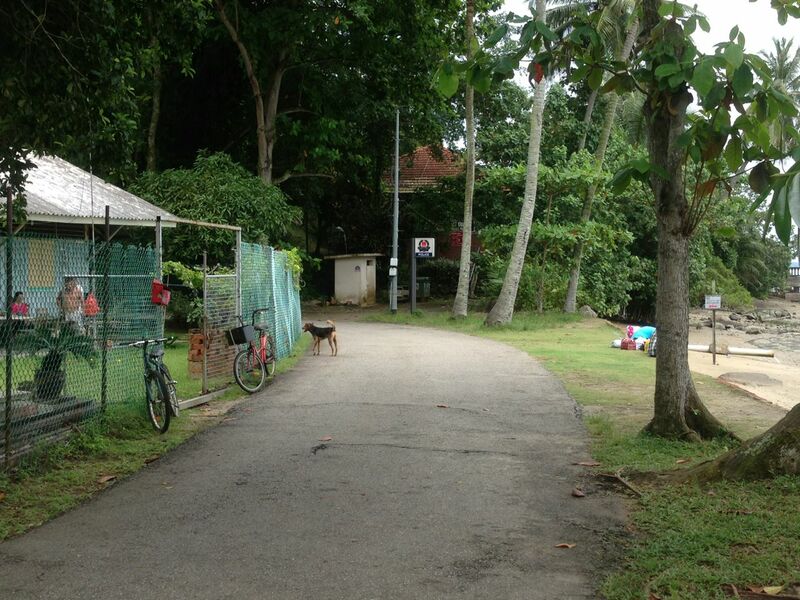 The boys spent the next day cycling through and past the reefs and wetlands of Pulau Ubin, taking absolutely no photos. I guess next time you have a long weekend free in South East Asia you can decide if you’d rather visit Langkawi, or Bangkok, or Bintan or Malacca or Rawa, or just take a tent to Pulau Ubin and look around at what they didn’t record for you. Or you could look at what Prasad did, and go to… well, where would you? Here’s some more information on camping in National Parks in Singapore. We’ve noticed weekend camping permits booking out faster over the last twelve months, so best to plan a weekend or two ahead (or choose a weeknight). Here’s where you apply online (at least one day in advance, for areas requiring permits). Me and Adrienne at 500 Adventures are SO IN SYNCH at the moment. 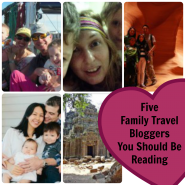 Check out her post about their camping trip across the UK. 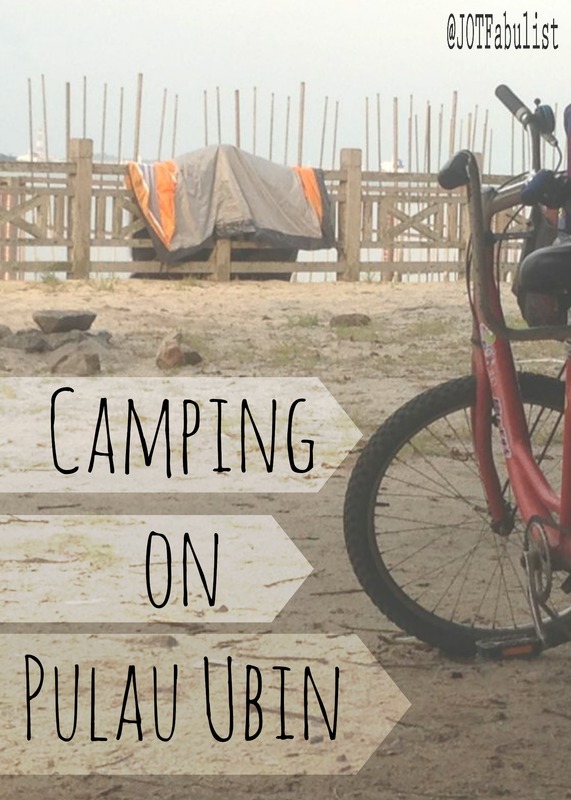 The post Soul Camping on Pulau Ubin appeared first at Journeys of the Fabulist. Hi, is there any tent for rent in Palau Ubin? Not that I know of… but if someone knows differently please update! Any shower facilities available there? Hi Belinda, I asked The Husband because he’s the one with all the experience and I’m disturbed to say he isn’t 100% sure. He says he thinks so. Usually he just stays overnight and I guess he’s ok with being sweaty? Something to look into next time! Will it be safe to actually leave your pitched tent at mamam while you go about Ubin touring? I would probably do it but then we don’t have a great tent or anything 🙂 . I think there were a couple of unattended tents there on the trip I’ve written about and if people are staying a few nights it must surely happen, but ours was set up, slept in, then packed straight back up the next morning and brought along, so we didn’t personally try it. I know when you set up at the other camp sites around Singapore you’re asked not to leave the tent unattended but Pulau Ubin has different rules. You could probably discuss it with the police at the post on registering. What we did do was leave our tent at the bike hire shop for half a day. They were happy enough to sit it in a corner for us, but it’s not so convenient if you’re planning to stay multiple nights. Let me know if you’d like to participate in the Race Around the World – info on upper right of my home page. I’d be happy to promote your blog. Gosh! Big topic to be invited to. I’ll pop over and contact you more directly. Thanks for thinking of me! I love Palau Ubin. such an antidote to Singapore. Our “I need to get the hell out of Singapore but don’t want to fly” spot is Rimba Resort on Sibu Island off Malaysia. I always come back completely refreshed but we do try and avoid crossing the border on weekends to avoid the queues. Rimba – quick google says it’s on the same Sibu Island as Sea Gypsy resort (of – to us – ExpatDadSG fame). Looks like the slightly more upmarket version (they have hot showers there). Looks nice! Good tip. Sounds like a great place to camp, shame there are no photos! I’m sure you will all have a great time camping around Singapore when you have a bigger tent! It’s on the Christmas list! Yeah, it’s not exactly the Gunbarrel. 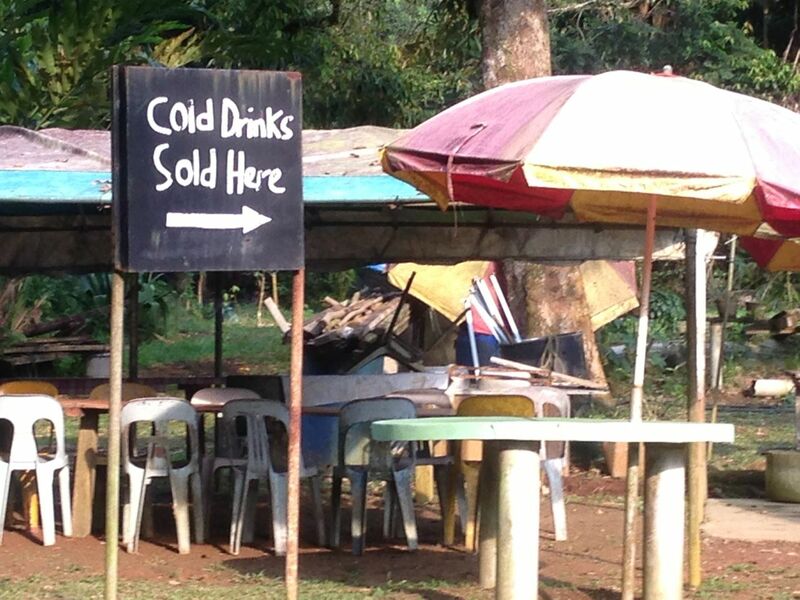 Although 500m to a drinks seller feels like a long way when you’re five, I’m sure. So Tasmania, Brisbane and Tokyo coming up? Yay!!!! However, camping is never a bad choice for a holiday in such an engaging as pulau ubin- I have such good memories from there. How did the boys manage in a tent? No surprising nightly guests in the tent? Yes, well I hope so. We’ve got to get our residency visas renewed before we set off for Australia at Christmas… but we have certainly booked! No surprising guests in the tent. We did see a wild pig whilst riding around but he stayed clear of the camp site. Coming from chaotic Indonesia, I like Singapore because it’s well planned and well regulated. That’s why we haven’t been to Pulau Ubin yet. 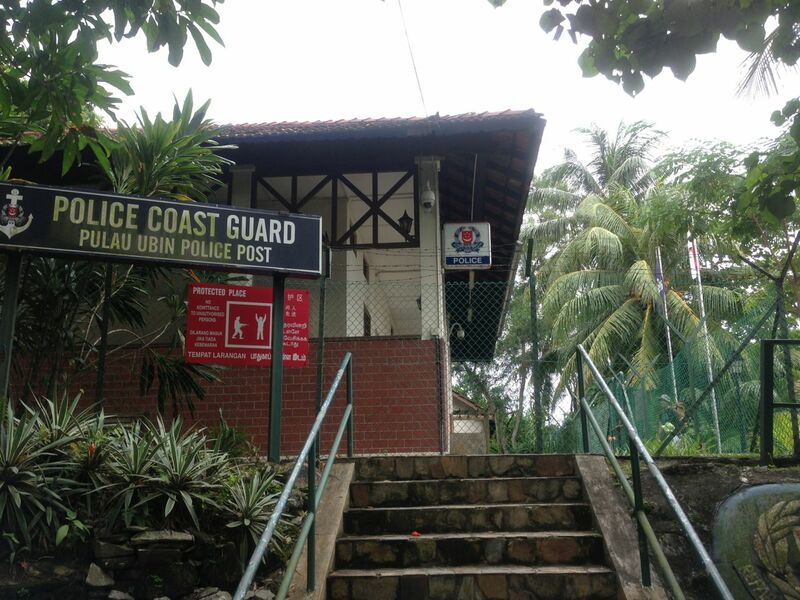 Pulau Ubin sounds a bit like Indonesia! But we might go there someday, since my husband really wants to see the place. I think I’d do the same in your shoes. We all need a bit of order and a bit of chaos. Varies from person to person but maybe not as much as we think. Yes, maybe a more waterproof tent… but apart from the rain, it’s quite pleasant here. Warm. Watch out for the insects of course – nothing you wouldn’t have to do at home. Ah! Wish I’d read this a few weeks ago. I have actually been posed with the question of what to do with a short weekend in southeast Asia. I’m going to make the jaunt to Yogyakarta. Can’t wait to see what I find there! Either way, will be looking forward to hearing about your trip. We’d like to make our way there, possibly next year (keep you posted).